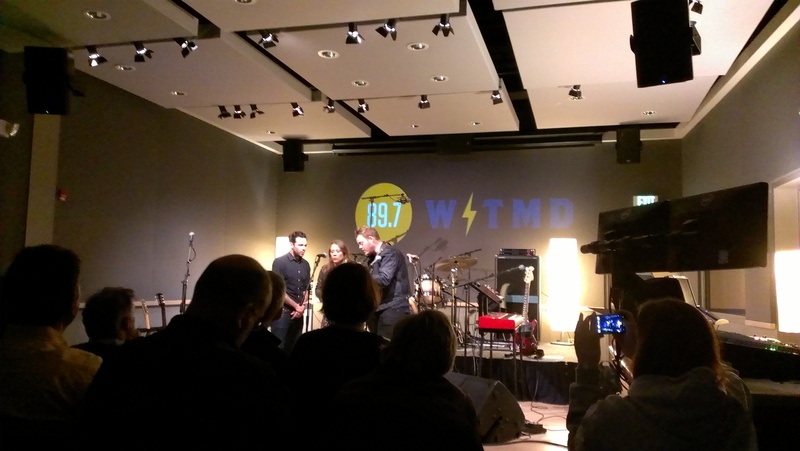 Last night I got to see The Lone Bellow perform live in the WTMD studio. They had an intimate seated concert open only to WTMD members. Happily I am a WTMD member, so I got the email inviting me to purchase tickets. I love The Lone Bellow a lot, so I was super excited about going. I however knew the concert was going to be right after I got back from my trip to Portland, so I debated for a hot second whether or not I should go. I’m really glad I did because as usual it was amazing. This was my fifth time seeing them live. Each time has been a very different experience. This time as advertised was a very intimate seated show. There was no more than 100 people there. Last time I saw them at a seated venue I thought it was weird because so much of their music at the time was upbeat and makes you want to dance. This set worked out much better because their sophomore album has a lot more slow songs on it. The majority of the songs they played for this concert were off the new album, so it didn’t feel as weird sitting there in my seat because they weren’t dancing around the stage. I really like the new album, so I was happy to finally get to hear music off of it played live. All the previous times I had seen them were well before its release. I’m amused that every time I’ve seen them play in Baltimore Zach has mentioned their first concert here, which was one of WTMD’s First Thursdays concerts in the park. He keeps talking about how a lion statue was staring at him the whole show. Then I had totally forgotten about how when I saw them at Soundstage, Brian tripped on a cord and fell off the stage landing on a woman in the front. She happened to be there again tonight, so they gave her a shout out and I was like oh yeah that totally did happen. Aside from the amusing banter, the music itself of course was fabulous. Their harmonies are always amazing and they have such great energy on stage together. I’m already excited to see them again. Turns out it will be at least two more times this summer. They announced at the end of tonight’s show that they’ll be returning to play the First Thursday’s concert on June 4, and as usual I have tickets to the Newport Folk Festival. They were announced as one of the acts for that festival a few weeks ago. Their set at Newport 2 years ago is still one of the best I’ve seen there, so I can’t wait to see them with that crowd again this summer. That show sounds wonderful. And we love reading about the little details from shows that make The Lone Bellow so great at connecting with the audience, like the lion staring at Zach!